the Sagar dweep system (sds , or the Sagar group of islands) in the Bay of Bengal is teetering on the verge of total destruction due to massive soil erosion and other natural calamities. The issue has now become a matter of global ecological concern. Originally, the sds comprised about 31 tiny islets. But most of them vanished due to massive land subsidence and rapid soil erosion caused by strong tidal waves and gales. Around 1947, the sds comprised of only five major islands and 18 small islets, which were uninhabited. The five major islands of the sds were: Ghoramara, Agunmari, Luouhora, Suparidanga and Sagar. By 1990, the map of sds changed completely as three major islands -- Louhora, Suparidanga and Agunmari -- vanished totally following strong tidal waves in the Bay of Bengal. Currently, the sds comprises only two major islands and around nine very insignificant land masses. 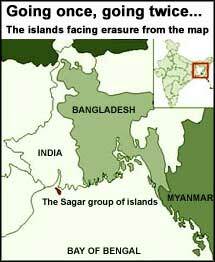 The two existing islands -- Ghoramara and Sagar -- have a total population of around 11,000. Ghoramara island, originally a 25-km land mass, has been reduced to 10 km and supports a population of 4,200. It is currently facing the danger of being totally dissolved in the Bay of Bengal. Oceanographers, ecologists and geologists hold that Ghoramara island can survive, at the most, till 2007, as the Bay of Bengal eats away one km of the island's land mass every year. On August 20, 1997, strong tidal waves ate up nearly one km of land area. The geographical condition of Ghoramara makes it extremely prone to natural calamities. While the southern area of the island is exposed to the Bay of Bengal, on the other three sides, it faces three highly ferocious and unpredictable rivers: Hooghly, Kachuberia and Baratalla. Though land subsidence also occurs in Sagar off and on, the island can survive for another 20-30 years. The sds is located near the Sunderban delta. Since this part of the sea is highly prone to hurricanes, cyclones and typhoons, risks to the sds are unique. The sds falls under the state of West Bengal. Ecological experts and oceanographers feel that the islands are vanishing due to total apathy on the part of the Indian government. In the Baltic sea, Pacific Ocean, Polynesia and Tasman Sea, a large number of isles, islets, coral islands and archipelagos have been saved from obliteration by checking tidal waves. If strong tidal waves are stopped, soil erosion can be controlled. Through concrete walls and other such measures, denudation and erosion of land has been checked in many parts of the world. The sds , however, awaits such measures for survival.